I over planned for the 2 week unit. We are on the 4th week of working and still not done. A problem with attendance has been a main issue. Students have been out hunting, traveling for NYO, or traveling all of last week for our district dance festival. We keep pushing through anyway. Only one group is almost finished with their house and report. I will focus on them. One of the 3 has been absent the past 2 days so I will focus on the other 2. One is a 10th grader who is a female (1) the other is an 11th grader who is male (2). I will refer to them as 1 and 2 throughout my reflection. Students first engaged in content through an assignment on Actively Learn. The title of the article was Heat, Temperature, and Thermal Energy Transfer. Students were to first read the article and then highlight 3 things they found interesting and use the notes feature to explain why, then highlight 3 vocab words they didn't know and copy the definition as a note, and finally respond to 6 questions at the end. They could resubmit answers as many times as they wanted for a higher grade. I would reply with feedback as shown below. This way student knew what to do to get a better grade. The feedback was given to students as quickly as I could read and type. This is part of the reason I really love to use Actively Learn. Feedback is in realtime and students don't have to wait until the next day to see where they are at. Students can make improvements right away. Most students want to make improvements if they don't get a proficient or advanced score. Only one student hates to do it. Here is an example of student 2 fixing his work. At first he just set up the problem. The question asked for an answer so I asked him to solve. He did not do the math right so I asked him to try again. He was confused and asked for help so I showed him how to do it. He then answered the question and wrote is in a complete sentence. This met the expectation as he had shown me the work and solved it giving him an advanced score. Most students did not show the work but he did. Conversions were hard for many students and I was able to go around and assist as needed. Some students even helped each other out. Student 1 is the top row. Student 2 is the bottom row. Next students watched 4 short videos on EDpuzzle. They were all about heat, temperature and thermal energy. EDpuzzle allows teachers to embed questions in to videos from YouTube and other sites similar to YouTube. Students again get almost instant feedback. 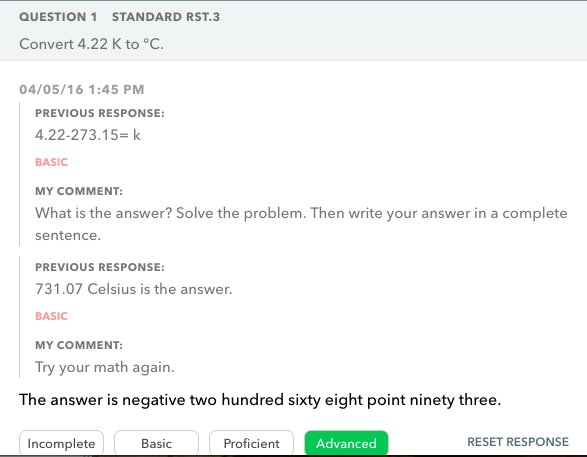 If the question is multiple choice students are shown the correct answer once they respond. If the question is short answer the teacher grades it as quickly as they can. 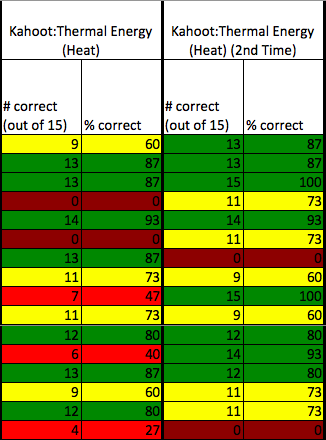 Below is a table showing the 2 students scores on the videos. As you can see student 1 did not complete the Thermal Energy & Dye video. 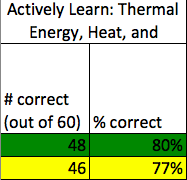 Sample responses from the 2nd video (Heat, Thermal Energy, and Temperature) are below. Student 1 understands both concepts easily. She uses complete sentences and all wording is easily understandable. For the first question she understands that a smaller object cools down faster because there are less particles. 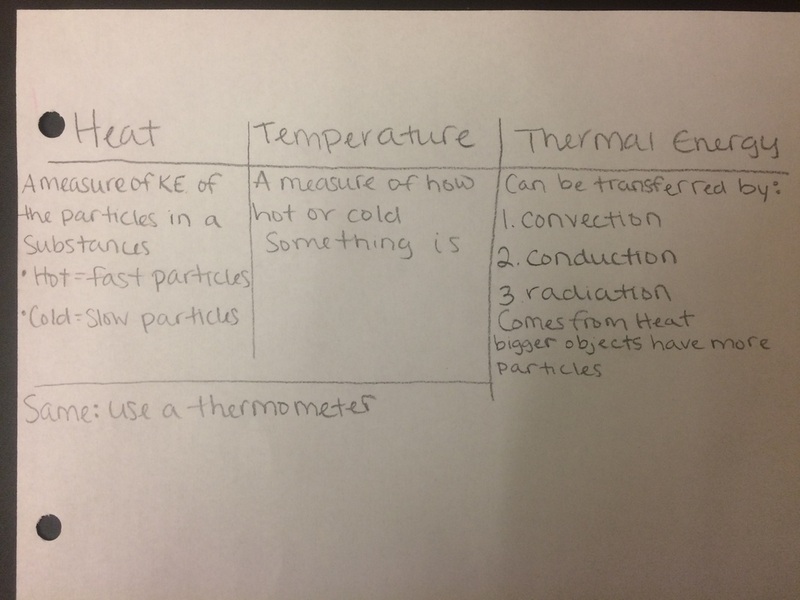 In the second question she understands that thermal energy comes form heat and temperature tells us how hot or cold something is. She received a 100% on this video. Each video was worth 10 points so she got a 30/40 (75%). 3 Kahoot games were played right after the EDpuzzle assignment on the 3rd day of the unit during the last 25 minutes of class. Students were all engaged and loved playing as usual. The average score was close to 60% for the 3 games. During the 4th week on day 16 of the unit we replayed the Thermal Energy game. This game was identical to the one we had played in the first week. Unfortunately the internet connection was not great so I'm not sure the results are completely accurate. The average was close to the same as last time, but more students were missing the second time around. Out of the students who were present both times we played: 4 improved their score, 2 stayed the same, and 3 decreased their score. Most improved or stayed the same telling me that students were learning throughout the course of the unit. Below are student 1 and student 2's scores. Student 1 increased her score by 3 points which was equal to a 21% gain the second time we played the Thermal Energy Kahoot! game. Student 1 missed only parts of class but never a whole day during the 4 weeks we have been working on the unit. Student 2 missed all of last week due to the dance festival in another village and his score stayed the same. It was hard for him, as for the other students, to figure out what was going on when they came back to class Monday. This game was played first thing Tuesday. I'm guessing he stayed the same because he has been out of class for so long. For the about 2.5 weeks students have been researching and framing and insulating a model house out of a variety of materials (wood sticks, popsicle sticks, cotton balls, jeans, fabric, foil, duck tape, scotch tape, and hot glue). Students were to design a house that would let the least amount of thermal energy out. Here is a copy of the handout that led students through the research, planning, building, and data collection part of the project. Students are not complete with this yet but hopefully will be complete by the end of the week. How did you contribute to your project today? Describe with as much detail as possible? Do you think you worked well as a group? Why or why not? Students were given 5 points for completing the reflection, 3 points for their response on number 1 and 2 points for response on 2. One the first question I was looking for a detailed response. This is why student 2 got a 10 and student 1 got a 9. On question 2 they got 1 point for saying yes or no and another point for giving a reason. I looked at question 3 to determine if the grade was fair. For the most part students were accurate and I gave them the grade they thought they should get. All students worked really well when building the house. I only had one student on one day choose not to work. I think this happened because she didn't know what to do. She is very quiet and frequently works by herself. I think being in a group was hard for her. After that one day I focused on helping her find her place and she seemed to work. Here is the rubric I will be using to grade the reports. Students were given this at the beginning of the 3rd week, as the first group was getting ready to test. This group is not finished yet so I hate to assign a grade. They have a great start but are still missing many major components such as the hypothesis and question. They also are working on the data table to add in as well. If I had to assign a grade according to the rubric. Right now they would earn 24 points out of 100. This is a very low score and I am confident they will do the necessary work to complete their report and ear a passing score. ​I would split up the report sections. I would make them record the question, hypothesis and introduction before building. Then after they finished building I would make them write the procedure. Next they would collect data and then finish the report. This way the report would be broken up and not all at once. They would also have checkpoints that would hopefully keep them motivated to get the report finished. I would also like to be sure students complete each part before moving on to the next. I did not make sure students completed the beginning work on actively learn and EDpuzzle. I started to get crunched for time and wanted all student to be a part of the project. Another thing I might try next time is setting up a calendar ahead of time so students can see how long they have. It probably would not have worked this time due to unforeseen absences but might help student manage time better in the future. Some groups are working at the pace of a snail and others are sprinting to the finish. When I set a deadline for ordering supplies students worked with what they had. Only one group complained. I believe this unit was very effective in reaching all students. Even the students who missed the content were able to step in and give ideas to their groups. I think this was the biggest advantage to the design thinking concept. If students have any background with the project then they are able to contribute and learn from others. I think they even learned some of the stuff other students learned in the lesson. I even saw students help other groups and give them ideas. The class had a very positive atmosphere with each group helping each other not just their own group. In the end, every group build a different house. The class is starting to see which materials were best based on the temperatures they got. Some groups are even going around asking other groups what they got for their temperatures. Students are asking questions of each other and not just me. They are problem solving as they run into challenges. I only wish I could do projects like this all of the time. I think they are still confused about the foil and this was evident today. Some students think foil is an insulator because they used it in their house, and they are believing that they only used insulators. We paused today, on day 16, to discuss this and I think students understood. They know it gets hot. I explained to them they use it because it gets hot fast, but then they used other stuff around it to keep the heat from the foil in. They all realized this to be true because some touched the foil and realized how much hotter it got than the rest of the stuff. We played another Kahoot game yesterday which revealed some supporting data, and I wanted to share. Students averaged 74% correct the first time we played and the 2nd time the average went up to 81%. Student 1 and 2 showed the same results as last time. Student 1 increased her score and student 2 stayed the same. Again I think student 2 missed a lot and is still trying to catch up. Student 1 is the top row and student 2 is the 2nd row. Students are still working to finish their reports. No group has fully finished yet. 2 students are working on a written report and are almost finished. I wanted to share what that looks like, since I have an example of the video. On this report the students would receive a 74/100. I will also factor in a final reflection when they are completely finished. They would get 5/5 points for organization, 2/5 for language/grammar, 4/10 for sources (they are not finished with this part), 5/5 for the question, 10/10 for the hypothesis, 20/25 for the introduction/research (It lacks depth, the students did not connect the ideas but just copied responses from their notes), 4/5 for procedure (they are missing the quantities of each of the items they used), 10/15 for data/observations (their description is just a restatement of the table and doesn't explain the table), and 10/20 for the conclusion (they did not give much for what they learned). Genevieve showed her pre and post test on the vocabulary and I think it was very well designed and shows that the students have learned a lot. Looking back I wish I would've done something similar with the vocab in my unit. Maybe I will try getting some video responses to vocabulary this next week. I noticed from one of her pics that all students are working hard. This has been the thing I notice on a daily basis when teaching my unit. Students are on task and I have to worry little about student behavior. Students are also willing to stay after school to work. I am wondering if this is the case for everyone? Teresa and Aleta both reminded me that I cannot control the weather and other activities outside of school. Students who are in class work the entire time and come after school. Usually students come after school just to fix a grade but these students are coming to finish their project. Students are now coming to learn instead of for a grade and this is a big piece of evidence that I was reminded of by both Teresa and Aleta. 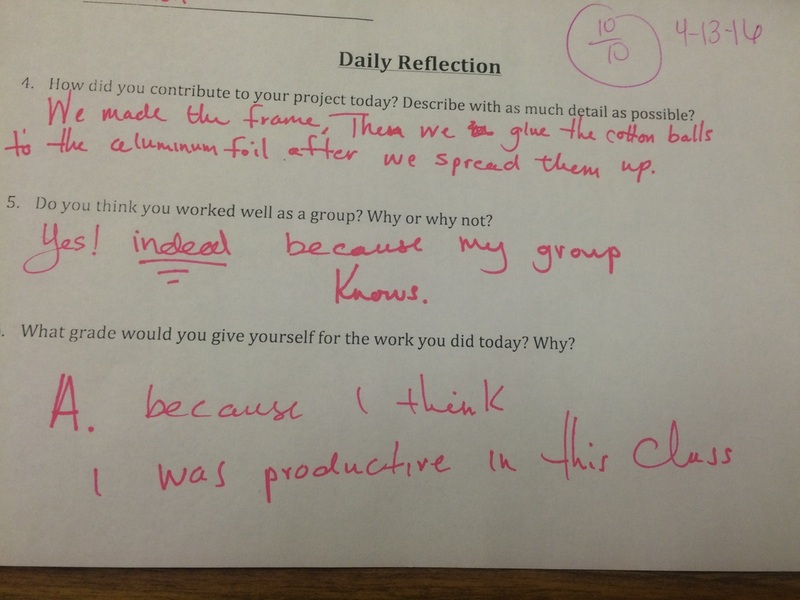 I like how Sally allowed her students to go back and fix their work. I used that strategy earlier on in my lesson. She said she had one student who refused to make changes. I have one of those students too. She refused to make the corrections to her work as well. I have not yet figured out a way to get her to want to try again. For my final project my evidence is going to be minimal unfortunately. I have had 9 days to teach the unit, and on average 5 of 16 students have been missing each day. This had drug out the timeline of the project making it impossible to teach. With weather being nice students are out hunting. I have also had 2 students miss almost the entire 2 weeks. I really don't know what to do. Students seem to fit right into the flow easily and participate but I am not getting the data I need. I will try continuing the unit next week but up to half my class or more may be absent due to our district dance festival. I will try to use who is left but my class may be extremely small. I do have data from the start with 3 Kahoot games, I also have question responses on actively learn, the research and planning, observations, a few videos of students, and finally I have the reflections from each day we have worked. Unfortunately I will most likely be lacking the best evidence (video lab report or written lab report). One good piece of evidence is that only 1 student has been off task during this unit. Students really like it and even stay after school to work. Some of my hardest to reach students have even come in to work after school and are totally engaged in building their house. Here are 2 videos of students explaining their projects. Here are the notes I have been keeping each day. This has more detailed info but is a little lengthy. Plus it does not necessarily relate directly to our essential question this week. It is great to hear that other teachers over plan as well. I liked how Teresa is using the same assessment 3 different times to gauge mastery. This is a great idea and offers proof of student learning. I wanted to stay away from traditional type tests so I did not want to do question answer types of things a lot. I did some front loading with reading and questions and then videos and questions. Next I provided a fun opportunity for Kahoot to see the learning so far. Next I will compare these to final reports, either video or written. However, my way will be a little harder to prove learning. Jeff was struggling with technology use. If students are familiar it is hard the 1st time around. I only added one new part actively learn and this made things take twice as long. This definitely speaks to picking a few technology resources and using them frequently. His post also made me realize how important it is to do small tasks. Even then this can be a challenge. Breaking things down for students can really help students to understand the goal. I am interested to see how the project for my students will go next week. We will definitely work together in small steps. I also have written directions to enforce my verbal instructions. I hope this works. Challenges: I did not have a lot of challenges this week. A big challenge will be trying to get the unit complete in 2 weeks. Students are taking a lot longer than anticipated to do some of the tasks. This is not necessarily a bad thing. Some tasks are more confusing to begin with so students are slower at getting started. Once students understand the task they work towards completion. Even though it is taking time, students are working and asking questions. I consider this a success as well as a challenge. 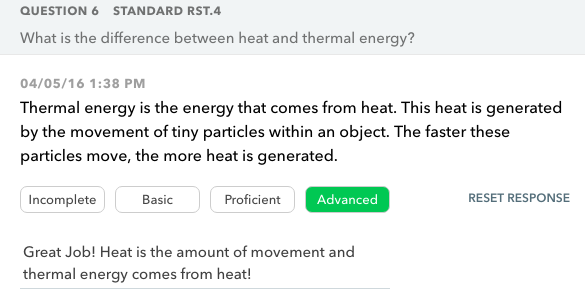 From Kahoot, actively learn, and ED puzzle I realized students did not understand the differences between heat, thermal energy, and temperature. Because of this I spent some extra time explicitly talking about the differences as well as allowing some time for students to look up some info on this topic. Another challenge was the internet connection. At the end of the week connection was really slow and students were being kicked out of Kahoot. This affects my data. Even so, we played 3 Kahoots and students averaged 60% correct. ​Successes: I made a guide to help scaffold the research process. This guide included questions that helped students focus their research. In the past I have tried a more free research but students struggled with what to do next. This guided research helps students know where to go. My students need practice with research and this is helping to build their skills. Instead of me being bogged down by questions students were able to help each other and I was able to assist as needed. For example, one group still struggled with the differences between heat, thermal energy, and temperature. They took the notes yesterday and when they read them today they were confused. Many groups used their notes on heat, thermal energy, and temperature to answer questions on their research. It was AWESOME to see students remember they had done notes and then to go back an use them. I think this is a great benefit of designing a lesson using the UBD template. Everything is interconnected and not used only once. Learning is a continual process. ​I took a lot of more detailed notes and included them below. This week I got some help in making sure my lesson was top notch for my students. Amy helped me to realize I left the self-reflection out of my plans. So I have since gone back and added that in. It was in my head, but I didn't really explain how this would work on paper. Aleta found many of my resources helpful. I always find it so beneficial when you get new resources, its like winning the lottery (the teacher lottery, if there were such a thing). I read 2 other blogs. I was amazed by both! Teresa had a very well-rounded plan. Lots of good teaching, videos, and small tasks for students to complete that would lead up to the final performance task. I liked how her unit did not just end with the final product. She went on the have the class learn from each other by reading the stories and talking about the math. I couldn't think of many suggestions for her. My main suggestion was that she make sure each student can answer the essential questions. Jeff had a math lesson too, but his was on linear equations. He was very creative in allowing students to look of attraction cost and calculate that for different number of students. Then the students could graph. I had 2 suggestions for him: that he tie in a NETS standard and that he tie in the essential questions to gauge student understanding. In his blog he mentioned allowing students to do something other than a poster. I gave him a few suggestions such as videos, brochures, or power points. I can't wait to start teaching my unit, I just hope the rest of the supplies get here by the end of the week so the students can start building next week. Essential question: How does my unit plan integrate best practices and theory of differentiated instruction? Below is a video of the final activity I plan to use as a performance assessment. Before teaching this unit I would like to create a bubble map showing each type of energy we learned about in the last chapter. That way students can see all the types and realize that we are focusing on one type in the next chapter of the book: thermal energy. We have already learned what thermal energy is, we just haven't applied that learning yet. I want to see what they already know. For teaching this unit I want to give students some background information through an assigned reading and some videos. In the assigned reading students will be asked to highlight and take notes through an online program called actively learn. Then they will respond to questions. I will give feedback as they respond and if they get the answers wrong they can ask for a reset. Then I will ask students to log-in to EDpuzzle and watch some videos. The video will pause and ask students to respond to questions. If they student does not know the answer they can rewatch that part of the video. Finally I will wrap up the teacher focused part with a Kahoot game to assess student understanding before moving onto the project. If students do poorly on the Kahoot I will go back and reteach the parts they do poorly on. Tomlinson (2014) says that instruction will work better if you use assessments to direct the class to the learning targets. The next phase of the unit will be a project. I wrote approximate days for this but different parts may take longer or shorter and I will adjust as needed. For this project, students will construct a house out of paper and other material and will measure the temperature of various parts of the house to see heat loss. The end goal is to create the most efficient house while keeping cost low. Smith and Thorne (2009), state that students need options, and to feel included in decisions, rather than being told what to do. In this project students will only be told the goal, not how to meet the goal. This is where the students have to determine what is best and how they approach the problem. This means no cheating. Jarrett (2016) says that if students are engaged then they will put in the the work. School is no longer about the grade but rather about solving the problem. If students aren't focused on the grade they will be doing their own work according to Kohn (2008). Research how homes are insulated and see what materials are good for this. Students will build model home and test their house. We will use a gotemp probe to measure the outside temperature and an ipad to try to visualize some of the heat loss. In my lesson I have reading, videos, questions to respond to, hands on application, and writing components. "If we provide a variety of ways to explore the content outcomes, learners find different ways to connect" (McCarthy 2014). Smith, Grace E., and Throne, Stephanie. 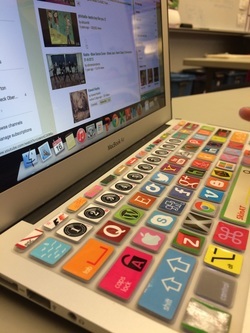 Differentiating Instruction with Technology in Middle School Classrooms. Eugene, OR, USA: ISTE, 2009. ProQuest ebrary. Web. 15 January 2016. This week really made my head spin So many great ideas but how to implement them will be quite the challenge. I wish I had been able to attend Twitter this week, but unfortunately I had no Internet or data at Chena hot springs. I was able to go back and read through the conversation, but there are just so many unanswered questions. How do we help students feel successful when the educational system around them does not fit their needs? I am graded on student achievement and putting in approximately 2 grades a week. How do I fit this into the needs of my students? I’m not sure I found an answer this week. I do know that some of the things I have been doing in my classes may not be the best for my students. I did not realize how harmful some things could be. After reading I really want to do away with formal tests for summative assessment, but then I know I am not preparing my students for a state standardized test. Tests are encouraged by the district and the state. I don't want my students to feel unsuccessful when they get test scores back, but I also don't want to waste time prepping students for a test that has little meaning to them or me as the teacher. Amy talked a lot about standardized tests that are done on computers. She made a great point about how these tests only tell us if a student has been taught how to take the test. There is such a push for differentiation and meeting students where they are at yet our evaluation is based on students all doing the same thing. This makes no sense. Teachers are wasting precious classroom time teaching students to take a test that really has no value to a student. Hopefully with NCLB going away and ESSA coming back into play we will see some changes for the better. Amy and Sarah both posted similar comments to my blog. They resonated with exactly what has been going through my head this week. How do I reach my students in a way that is beneficial to them while also following what is required by my district? I need summer to get here sooner so that I can do some revising of my current teaching practices. Essential question: How can I use both formative and summative assessment to enhance (or at least not interfere with) intrinsic motivation? This week was a little hard for me. I was traveling and lacked good internet connection. I finally returned home yesterday after getting stuck in Bethel for a night. So here is my blog post a little late. My mind went in circles this week. How should a teacher grade? Is there a right or wrong way? To be honest I still can't answer this question, but I can share what I learned. Grading is an inadequate report of an imprecise judgment of a biased and variable judge of the extent to which a student has attained an undefined level of mastery on an unknown proportion of an indefinite amount of material. Assessments are at the core of most grading. Assessments are hard to create. Tomlinson (2013) states that “because assessments are constructed by human beings and taken by human beings, they are always likely to be imperfect measures of a student’s true knowledge of a topic.” There are 2 main types of assessments: Norm-referenced (NRT) and criterion-referenced (CRT) tests . According to Linda Bond (1996) the reason to use an NRT is the classify students. This may be useful in helping to decide where to place students in the classes that a school offers but may do little in the classroom. CRT's do the opposite. They are used to compare but are used to determine what students know. They got it. They did everything that was asked and more. They pretty much got it. I love this idea but the hard part is what is required by the school district or even state. It would be hard to make a gradebook to fit this type of grading. This is the problem that a lot of the reading discussed. More districts need to change the requirements of teachers. I am required to put in approximately 2 grades a week in a gradebook that is not set up to grade based on meeting certain criteria. This search for more information on how to assess students led me back to something similar from an earlier week where I was able to explore design thinking. The main point of Middle School Maker Journey: Assessment in an Ungraded Classroom by Kevin Jarrett was that if students are engaged then they will put in the the work. School is no longer about the grade but rather about solving the problem. This is the whole point of education. If students aren't focused on the grade they will be doing their own work accoding to Kohn (2008). Students are more likely to resort to cheating if they see it can lead to good grades. Kohn also states that "cheating is relatively rare in classrooms where the learning is genuinely engaging and meaningful to students." So the more creative and interesting activities you include in your classroom the more likely students will actually be learning. I like how the categories are labeled. It makes it feel as if you need to keep working. Instead of traditional rubrics where low scores make you feel like a failure. Here is a sample of the Question rubric. Bond, L. A. (1996). Norm-and Criterion-Referenced Testing. ERIC/AE Digest. Retrieved March 26, 2016, from http://www.ericdigests.org/1998-1/norm.htm. Tomlinson, Carol Ann, and Moon, Tonya R. (2013) Chapter 6: Assessment, Grading and Differentiation. Assessment and Student Success in a Differentiated Classroom. Alexandria, VA, USA: Association for Supervision & Curriculum Development (ASCD). ProQuest ebrary. Web. Retrieved March 26, 2016, from http://egandb.uas.alaska.edu:2081/lib/uasoutheast/reader.action?ppg=135&docID=10774725&tm=1428975296051. This week I think Twitter was very helpful to bring everything together. There was just so much reading. I felt like there wasn’t enough time to absorb everything. Teresa and I hosted Twitter and she made a great suggestion to split it. She did the brain articles and I did the poverty articles. This gave me a chance to really read the poverty articles and focus on them. It made me not feel so overwhelmed with the reading. Later I was able to go back and read the brain articles. Catherine posted a really great summary of brain-based learning. I was struggling to come up with such a concise summary. She pointed out some of the things that I found really interesting. For example, how genes for behavior and learning can be turned on or off. She also talked about how IQ can be changed. Before this week I didn’t realize how much teachers and others could affect a person IQ. I knew IQs weren’t fixed, but I didn’t realize IQ could be changed by as much as 20 points or more. Teresa talked first about safety. I think this is a great point to bring up and I am so glad she wrote a lot about it. Safety is our number 1 priority. This means that as teachers if we don’t make our classroom feel safe we will never get students to where they need to be. Teresa tied everything together very nicely. Differentiation and brain-based learning go together because we cater to what students need in both approaches. If we add PBL to the mixture we are working to develop higher-order thinking which is a skill students will need no matter what their future holds. This week for my blog post I was really happy with the articles I found. Twitter came through for me again. I read through my Twitter feed and found 3 articles that related to what we were talking about this week. I really liked one article that talked about a fixed mind-set and a growth mindset. These were not terms thrown out in the reading this week but describe exactly what the author was talking about. We as teachers need to be positive and show students hope. Improvement is possible and that is all we can ask for as teachers.